Hyde Park Home is a Los Angeles-based custom furniture and lighting design and manufacturing company serving the interior design and architectural markets. Each piece we produce is hand made to order in a range of finishes and styles ranging from antique to contemporary. Quackenbush & Winkler was founded in 1968 by Ralph Quackenbush and Bob Winkler, artisans with a vision to bring the finest French and English country furniture to discerning clientele. Antique Designs was founded in 1964 by Thomas Lockie. For over four decades they continued to make beautiful custom antique reproduction furniture for designers throughout the United States. 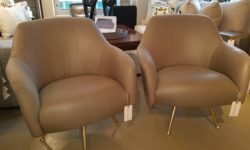 In more recent years, they introduced a new and exciting collection known as A.D. Nouveau to meet the ever increasing demand for high quality modern and transitional style furniture. Ron Jesse Lighting‘s founder, Ron Jesse, is a thirty year veteran of the lighting industry, and for the past twenty-two years he has been hand crafting luxurious custom lighting for the residential and hospitality markets. His eye for design combined with his engineering background, allow for the creation of heirloom-quality fixtures including classic, transitional and contemporary styles.